"Moana" is a hawaiian word roughly meaning large body of water or Sea. 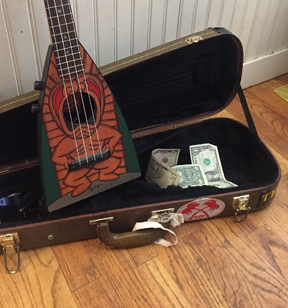 There are two Ukuleles I have seen with the Moana Name. One is Circa 1950's, with the Hawaiian coat of Arms on the headstock, and a sound hole lable that states "Made in Hawaii by a Specialist"
The other is modern, Made in China. It carries the Moana name on the headstock. There is also an "Ala Moana" brand which is similar in appearance, and also made in China, but I do not know if they are connected.